Enemies: Roger Carstairs, Faceless Man, False Face, Colonel Faroun, "Funny Money Mummies", "Soviet Spacemen"
Powers/Abilities: Described by the Daily Sentinel newspaper (see comments) as a "typical American boy," Bob Brant was anything but typical. Appearing to be about sixteen years old, the athletic and acrobatic Bob was quite a talented amateur aerialist, and he was not adverse to attempting high-risk trapeze stunts. He had piloting skills and was able to fly an airplane. A good fighter and a quick-thinker, he kept his composure in stressful and perilous situations. Accompanied by his three friends, Bob took part in a series of extraordinary adventures. Bob once drove a dilapidated old automobile. History: (Man Comics I#26/1 (fb) - BTS) - The past of Bob Brant is largely unrevealed, but he lived with his family in the suburbs outside of New York City. 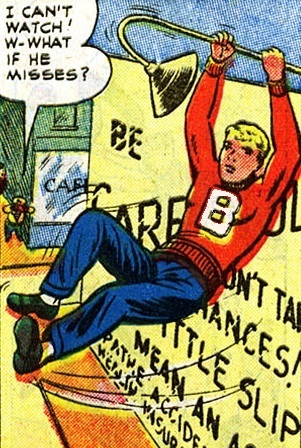 At an early age, Bob's mother trained him on how to use the trapeze; but when Bob was about six, his mother tragically died in a circus accident. 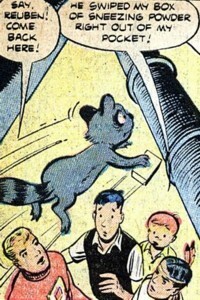 At some point in time under unrevealed circumstances, Bob acquired his pet raccoon Reuben, and became acquainted with his three closest friends: Bomber, Daffy, and Feathers (see comments) -- the group of juvenile adventurers were known as The Trouble-Shooters. (Man Comics I#26/1) - While practicing on the trapeze in Hangar Thirteen, Bob learned that a city committee had selected him to be the city's honorary mayor-for-the-day, so he and the other Trouble-Shooters went to City Hall. Bob and the boys were in the mayor's office when False Face's henchmen broke in and forced Bob to place a phoney emergency call to the police commissioner to create a distraction while False Face kidnapped U.N. delegate John Carter. 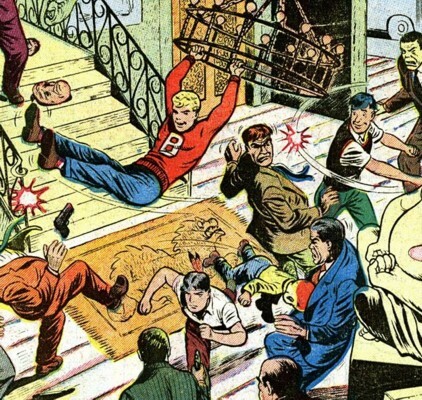 The boys later followed False Face to a warehouse in Chinatown, and Bob performed a risky stunt by swinging from a billboard to the roof of False Face's hideout to gain access into the building, then he and the Trouble-Shooters rescued Carter. (Man Comics I#26/3) - During a school vacation, Bob and the Trouble-Shooters, along with Carol and Bess, accompanied Mr. Brant when he went on a mission to ease political unrest in the tiny Middle Eastern country of Idnshar -- while there, the boys encountered Bob's lookalike, the teenage King Iba-Taub, and prevented a political revolution instigated by Colonel Faroun. (Man Comics I#27/1) - Bob and the Trouble-Shooters rescued their teacher Professor Klein when he was kidnapped by the fugitive Nazi known as the Faceless Man; they also prevented the evildoer from destroying the city's utility system. (Man Comics I#27/3) - When they were accidentally trapped aboard Lance's plane, Bob and the Trouble-Shooters were flown to Australia, where they were later trapped aboard a Russian rocket headed to the Moon. After overpowering the Soviet spacecraft's crew, the boys put on spacesuits and planted a makeshift American flag on the lunar surface before safely returning to Earth. (Man Comics I#28/1) - While doing some research for a school exam at the city's supposedly "haunted" National Museum, Bob and the Trouble-Shooters broke up a counterfeiting ring. 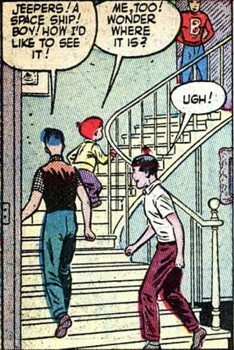 (Man Comics I#28/3) - Bob and the Trouble-Shooters, along with Carol and Bess, were invited to the estate of Mr. Carstairs to visit Carstairs' son Roger. 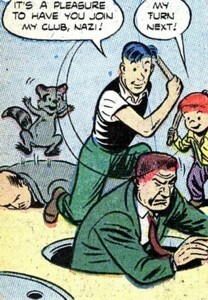 The boys later learned that Roger was a mutant, and he was partnered with False Face and his gang to commit a series of bank robberies. 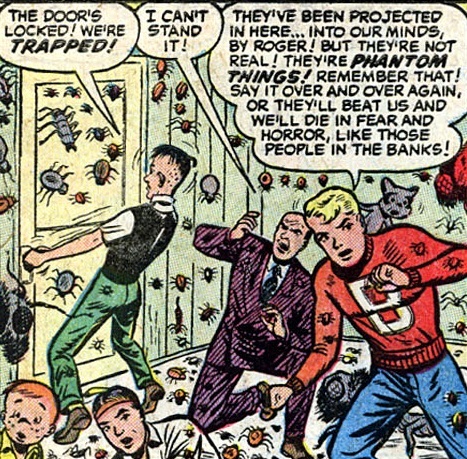 Bob and the Trouble-Shooters and Mr. Carstairs were locked in a room and attacked by Roger's mentally-projected images of giant insects -- while the others panicked, Bob kept his composure and convinced them that the bugs were only imaginary and they shouldn't fear them. The boys broke out of the room, but the psychic projections spilled out after them and began to overwhelm False Face and his men; the angry False Face killed Roger Carstairs and escaped. These stories were kind of simplistic and hokey, but still fun to read; all the stories ended with the various supporting characters unaware that Bob and the Trouble-Shooters participated in the adventures. I didn't include a sub-profile for Lance Brant (who was an operative for an unspecified government agency affiliated with the United Nations -- maybe an early version of SHIELD?) because he was featured in solo stories in Man Comics I#26-28 (...in stories where his kid-brother didn't outshine him), so he ranks a profile of his own. I'll hold off on Feathers because I remember once reading somewhere a few years back where it was suggested that Feathers might have been Will Wingfoot, the father of Fantastic Four associate Wyatt Wingfoot -- but when you take into account the era in which these stories took place and Marvel's ever-sliding timeline, it kinda makes that unlikely (of course, Feathers could always have been Wyatt's grandfather). Feathers never mentioned which specific tribe he was from, but when referring to Reuben, he mentioned his people's word for raccoon was arakun (@ Man Comics I#27/1), which is derived from the language of the Algonquin people -- but since the Algonquin weren't known to inhabit territory as far west as Oklahoma (where Wyatt's Keewazi tribe had their reservation), there's probably no connection. 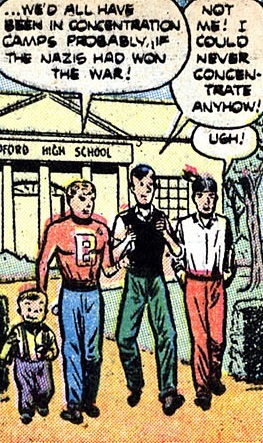 The name of the boys' school was never mentioned, but in the one panel where its name was partially visible, I can make out --FORD HIGH SCHOOL... perhaps it was actually BRADFORD HIGH SCHOOL (in which case, it might have been named for one of the several historical American figures named William Bradford) -- if that were so, then that would explain that big white "B" Bob wore on his letterman's sweater. Since Bob, Daffy, and Feathers were all in the same class, I'll assume the three of them were about the same age (around sixteen), but why did they associate with Bomber, who looked to be about half their age? 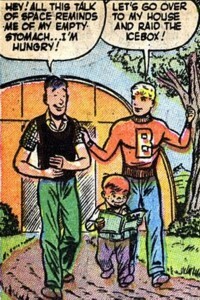 My guess is that a few years earlier, the three boys babysat for the toddler Bomber, and he just continued to hang around with them like a pesky little brother (The Secret Origin of the Trouble-Shooters?). So whatever happened to Bob Brant and the Trouble-Shooters? After leading such adventurous lives in their youths, it's hard to imagine they'd find much fulfillment when they grew up just working 9-to-5 jobs as accountants, shoe-salesmen, or whatever -- maybe they eventually enlisted with SHIELD. 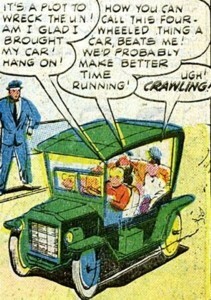 How about a Trouble-Shooters mini-series with stories involving the boys sharing adventures with other heroes of the 1950s era: Captain America (William Burnside) and Bucky (Jack Monroe), Rex Lane, Sub-Mariner and Namora, then (a few years later) Jimmy Woo's "G-Men," the Monster Hunters, and even the First Line -- with his acrobatic skills, I can even see an adult Bob in the 1960s becoming a costumed Daredevil-type hero called... Trouble-Shooter (of course). And the Daily Sentinel newspaper mentioned above was probably not the same as the one published by Britt Reid (AKA The Green Hornet). 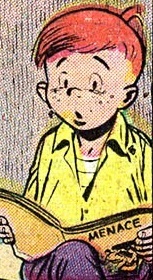 Apparently the youngest Trouble-Shooter (He mentioned he was in a lower grade than the other three Trouble-Shooters (Man Comics I#28/1), so he probably attended an elementary school near the older boys' high school). The impish Bomber seemed to enjoy a good prank (as evident from the box of sneezing powder he was once carrying @ Man Comics I#27/1). Although he was only about three-feet tall, the scrappy freckled redhead wasn't afraid to tackle full-grown adults, and he was known to headbutt larger opponents in the gut. Bomber excitedly ran to Hangar Thirteen from the post-office after he picked up the box of water pistols they had ordered; later, after he saw Reuben burn his paws in a jar of Chinese mustard, Bomber came up with an idea for improvised weaponry when he thought of filling the water pistols with the spicy condiment to use against False Face and his henchmen. 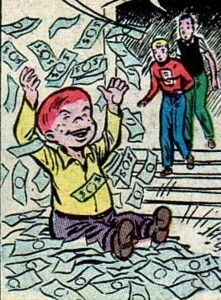 After the boys battled counterfeiters, Bomber was overjoyed as he sat in a pile of money -- he could finally buy a new bike! -- but he was disappointed when he learned the cash was phoney. A fellow classmate and friend of Bob Brant, Daffy was one of the Trouble-Shooters. He was tall and skinny, and he had a tragic Moe Howard-haircut. 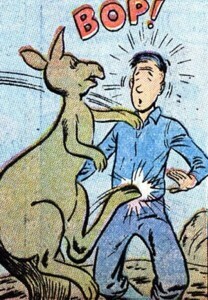 Although he was a bit dim-witted, Daffy was a good fighter (...despite getting sucker-punched by a kangaroo in Australia). A fellow classmate and friend of Bob Brant, Feathers was one of the Trouble-Shooters. The stoic Native American teenager wore a red headband adorned with two feathers. He was usually reticent, often saying little more than a stereotypical "Ugh!". 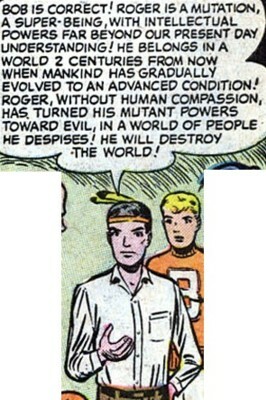 But when the need arose, Feathers proved himself to be quite erudite and eloquent, and he was a fount of knowledge on such diverse topics as geography, medieval history, and mutants (He could give Reed Richards competition when it came to long-winded explanations). 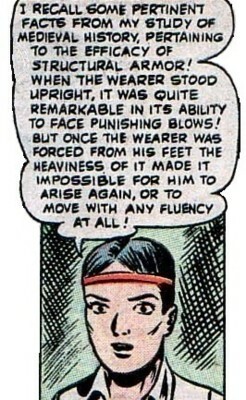 Besides providing occasional words of wisdom, Feathers was also a good fighter. When the boys were in a supposedly haunted museum and attacked by gangsters wearing suits of armor, Feathers came up with a way to defeat their foes. Feathers was also able to correctly ascertain that Roger Carstairs was a mutant. 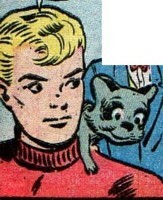 An unusually intelligent and mischievous raccoon, he was Bob Brant's loyal pet. 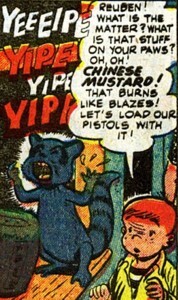 (Man Comics I#26/1) - When the boys followed False Face to his Chinatown hideout, the curious Reuben burned his paws in a jar of Chinese mustard at an outdoor cafe -- Reuben's misfortune gave Bomber the idea for the boys to fill their water pistols with the spicy condiment to use against False Face and his gang. (Man Comics I#26/3) - In the Middle Eastern country of Idnshar, when Bob was locked in "the dungeon that shrinks," Reuben climbed in through the barred window and untied the ropes that restrained him. (Man Comics I#27/1) - Reuben witnessed the Faceless Man kidnapping Professor Klein -- his excited behavior tipped the boys off that something was amiss; later, Reuben grabbed a box of sneezing powder from Bomber's pocket and sprinkled it down upon the Faceless Man and his gang, causing them to suffer a mass sneezing fit. After the adventure, the boys met Bess and Carol at the soda shop, and the playful Reuben got into Carol's handbag, then shook the powder-puff from her compact, dusting Carol with powder. Located in the suburbs near New York City, it was a two-story house where Bob Brant lived with his father (...and possibly with his brother Lance, too (Lance did seem to hang around there a lot)). Used by the boys as their clubhouse, it was a Quonset hut apparently located within walking distance of Bob Brant's home (possibly it was at the same private airport where Lance kept his plane). In memory of his deceased mother, Bob had one of her old circus posters on display on the wall by the front entrance. 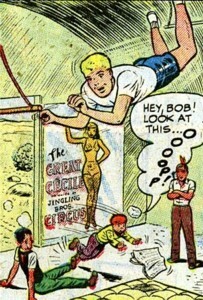 There was also a trapeze suspended from the building's ceiling, which Bob practiced on. (Man Comics I#26/1) - In Hangar Thirteen, Daffy and Feathers were watching Bob practice on the trapeze, when Bomber came running in with a newspaper (Daily Sentinel) that reported that a city committee had selected Bob to be the city's honorary mayor-for-the-day. 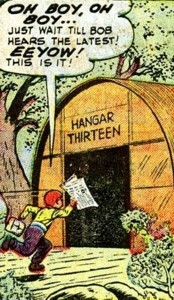 (Man Comics I#27/3) - The boys were sitting in Hangar Thirteen, reading science-fiction comic-books and talking about futuristic rocket flights to the Moon (...little dreaming that they would soon be making a lunar excursion of their own). An old automobile (make, model, and year unrevealed), it was driven by Bob Brant to take him and his friends to City Hall when Bob was selected to act as the city's honorary mayor-for-the-day. Later, the four boys used it to drive to U.N. delegate John Carter's house when they learned that False Face was planning to kidnap him. The boys arrived too late to stop the abduction, but followed False Face as he drove his hostages to his hideout in Chinatown. Head of the United Nations security police, he had been married to Cecile until her death; he was the father of Lance and Bob Brant, and a friend of U.N. delegate John Carter. (Man Comics I#26/1) - In his home, Mr. Brant was discussing some very important United Nations business with Lance and John Carter regarding the threat of False Face. 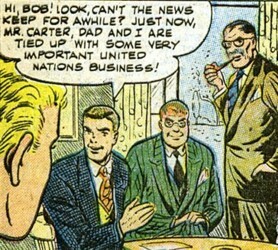 (Man Comics I#26/3) - The United Nations sent Mr. Brant on a mission to ease the political unrest in the tiny Middle Eastern country of Idnshar -- since it was during a school vacation, he took Bob and the Trouble-Shooters, and Carol Carter and Bess along. (Man Comics I#27/1) - Mr. Brant went to the home of Bob's teacher, Professor Klein, to warn him that the fugitive Nazi agent known as the Faceless Man was after him. 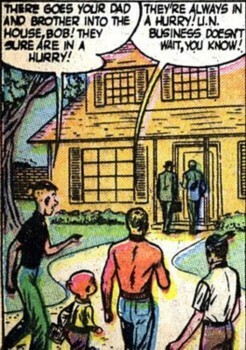 (Man Comics I#27/3) - In his home, Mr. Brant was talking to Lance and learned that his elder son was being sent on a mission to investigate reports of a Soviet rocket; Mr. Brant warned Lance to be careful. (Man Comics I#28/1) - In his home, Mr. Brant read a newspaper article to Lance about more counterfeit money turning up in the city; Lance mentioned he was investigating the case, and Mr. Brant said his U.N. department was concerned as well, because it made "bad propaganda". Then Bob walked in and told his father he was going to the museum to do some research for a school exam. (Man Comics I#28/3) - In his home, Mr. Brant was discussing with Lance about a series of bank robberies in which the people within the banks apparently died of fright -- Lance's department was investigating, and Mr. Brant told Lance his U.N. security police had been alerted because it was such a serious situation. Then Bob walked in and told his father that he, the Trouble-Shooters, and Carol and Bess were going to the Carstairs estate for a party; Mr. Brant told Bob to have a good time. She had been the wife of Mr. Brant and the mother of Bob Brant. 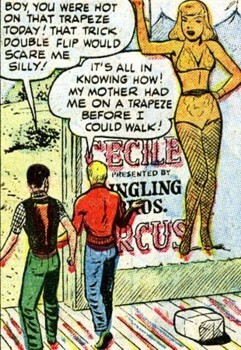 (Man Comics I#26/1 (fb) - BTS) - Cecile had been a famous trapeze artist with the Jingling Bros. Circus, but after marrying Mr. Brant, she quit the big top. After Bob was born, Cecile began to train him on the trapeze before he could even walk. But circus-blood was still in her veins, so when Bob was about six, Cecile returned to the circus for just one more season -- tragically, during a performance, the rope to her trapeze snapped, and she was killed from the fall. Bob was left with a circus poster of his mother, which he prominently displayed in Hangar Thirteen. (Man Comics I#26/1) - After watching Bob practice on his trapeze in Hangar Thirteen, Daffy complimented him on his skills, and Bob briefly mentioned his mother as they passed by the poster. The redheaded Carol Carter was the daughter of U.N. delegate John Carter, and the bespectacled brunette Bess was Carol's ever-present friend. 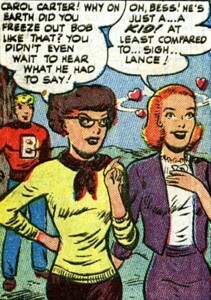 Carol was Bob Brant's sort-of girlfriend (she regarded Bob as too timid, totally unaware of the adventures in which he participated; she was much more infatuated with Bob's older brother Lance). Bess was Daffy's girlfriend (...at least that's what Daffy considered her -- whether she reciprocated his feelings is unrevealed). (Man Comics I#26/1) - Bess was visiting Carol at her home when False Face abducted the girls and Mr. Carter to prevent Mr. Carter from casting an important vote at the United Nations. (Man Comics I#26/3) - During a school-break, Carol and Bess were invited by Mr. Brant to accompany him, Bob, and the Trouble-Shooters to the tiny Middle Eastern kingdom of Idnshar (...but while Bob and the boys were stopping a political revolution, the girls seemed to just stay in the hotel). (Man Comics I#27/1) - Carol and Bess accompanied Bob and the Trouble-Shooters when they were invited to Professor Klein's home, but they all left after Mr. Brant stopped by to warn Klein that the Faceless Man was after him. 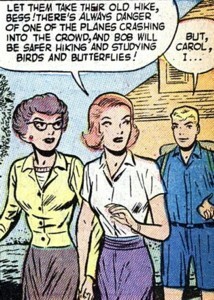 (Man Comics I#27/3) - Carol and Bess invited the boys to watch a jet plane demonstration, but Bob fibbed and told her he and the Trouble-Shooters were going bird-watching (...much to Carol's disdain). When they next passed by the boys some time later, Bess told them about all the excitement they'd missed, and Carol made a derisive remark about Bob (Unbeknownst to the girls, Bob and the boys had just returned from the Moon). (Man Comics I#28/1) - When Bob and the Trouble-Shooters went into a supposedly haunted museum, Carol and Bess refused to go along, and they told the boys they'd meet them later at the soda shop. 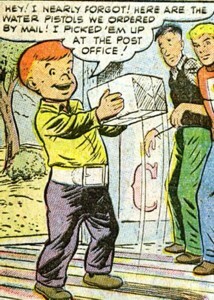 The boys broke up a counterfeiting ring operating out of the museum, and shortly afterward they joined the girls; Carol noticed Bob holding a $20 bill (a counterfeit souvenir for solving the case), and she requested that Bob buy her and Bess sodas, but when Bob refused, Carol and Bess left because they thought he was being stingy. 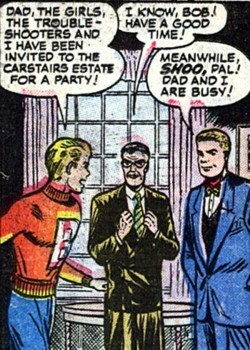 (Man Comics I#28/3) - Carol and Bess, along with Bob and the Trouble-Shooters, were invited by Mr. Carstairs to his estate for a party for his son Roger (Carol mentioned she thought Roger Carstairs was "fascinating," "cute," and "interesting," possibly to make Bob jealous.). The girls were greatly upset when they later discovered the Carstairs' maid Lucy dead, with a look of terror on her face. 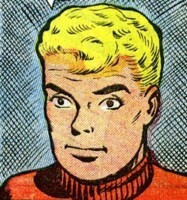 The father of Carol Carter, he was a delegate with the United Nations, and an associate of Mr. Brant and Lance Brant. He had been appointed to act as a proxy-vote for the minister of Norovia when the minister was recalled. 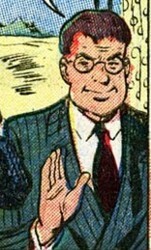 Lance had heard reports that False Face had been hired by the Reds to kidnap Carter to prevent him from casting the important vote, and he suggested they assign a bodyguard for Carter, but Carter politely declined the offer. Later, False Face broke into Carter's home and took Carter, Carol and Bess hostage. False Face took them to his hideout in Chinatown, but Bob Brant and the Trouble-Shooters fought the criminals until the police arrived to make the arrests.